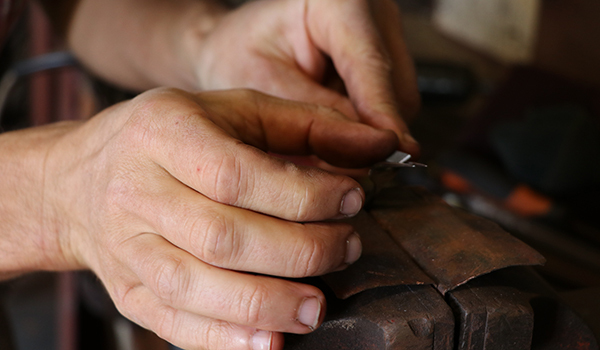 The Hunter and surrounding community is invited to bring their old metal items and have them repaired at the inaugural blacksmith repair day being hosted in Branxton this Saturday 16 June by local blacksmith artist and sculptor, Will Maguire. Supported by the University of Newcastle’s Centre for 21st Century Humanities, Mr Maguire will work at the forge on the day alongside colleagues from the Artist Blacksmiths Association of Australia to repair steel and metal household items as well as gardening or farming equipment and decorative objects. Mr Maguire was awarded seed funding for the project after pitching the idea for the repair day at the Centre for 21st Century Humanities Start Up Workshop held in June last year. Director of the Centre, Professor Hugh Craig, said the judges at the workshop were impressed with Mr Maguire’s desire to foster a sense of community and create a culture of reuse. Attendees are invited to make a small donation to have their goods repaired, with all proceeds going to Slow Food Hunter Valley who will be supplying a bite to eat on the day. “We’d love it if those bringing in items could make a donation. All proceeds raised will go to the Slow Food Hunter Valley who use the funds to educate local kids on the value of food and its production,” Mr Maguire said. Jobs will be taken on as they arrive by the volunteers available on the day, or people can email Mr Maguire and register their interest in advance to discuss the suitability of an item in need of repair at blacksmithnow@outlook.com. Processes available include forging, electric welding, brazing, riveting, fabrication, bending, straightening, cutting and sharpening/redressing edges. The repair day will be held at Mr Maguire’s Workshop, 664 Elderslie Road, Elderslie (near Branxton) from 9am to 4pm.